Kiwanis of Lafayette congratulates Michael Goss, a student at St. Michael Catholic School in Crowley, Louisiana, our 2016 Kiwanis Regional Spelling Bee Champion! 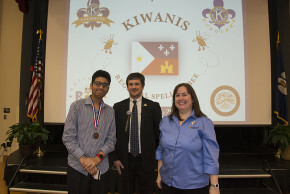 On Friday, March 4, 2015, the Kiwanis Club of Lafayette in partnership with the Kiwanis of Acadiana hosted the 2016 Regional Spelling Bee at Southwest Louisiana Community College. 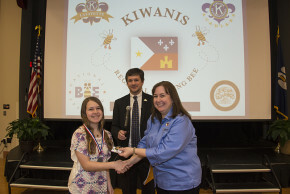 Elementary and Middle School students from across the Acadiana region participated in this year's bee. Michael edged out last year's champion, Megan Lavergne of Carencro Catholic School, who was this year's runner-up. Finishing in third place was Faiz Baloch from Milton Elementary School. 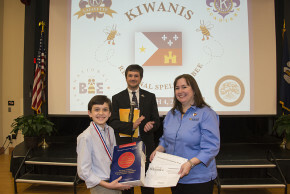 As this year's champion, Michael won an expense paid trip to Washington D.C. to attend the Scripps National Spelling Bee to be held May 22–May 27, 2016. He also won a $200 gift card to Books-A-Million and an unabridged dictionary.